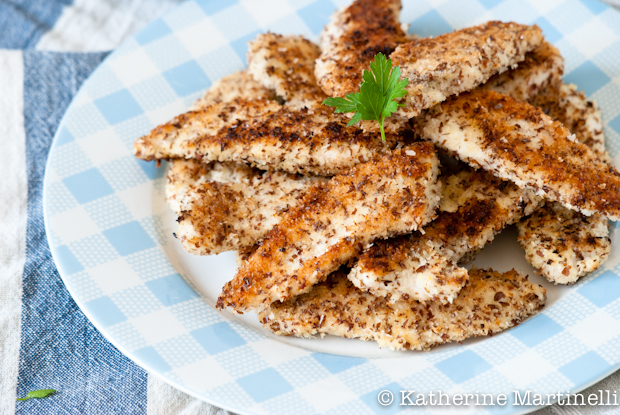 In addition to picky eaters, these are also perfect for kids with a gluten intolerance or wheat allergy who miss traditional chicken fingers. I fried the coconut chicken fingers in the same fashion that my father used to make chicken cutlets for us, but you could also bake them for an even healthier option. The addition of a bit of tamarind concentrate to the ketchup adds a pleasantly sour taste and gives the whole thing even more of a tropical flavor. For this week’s blog hop, I want to see your very favorite kid-friendly recipes, from homemade baby food to your fail-safe mac and cheese. Do you have a picky eater? What foods do they love and hate? Let me know in the comments below! 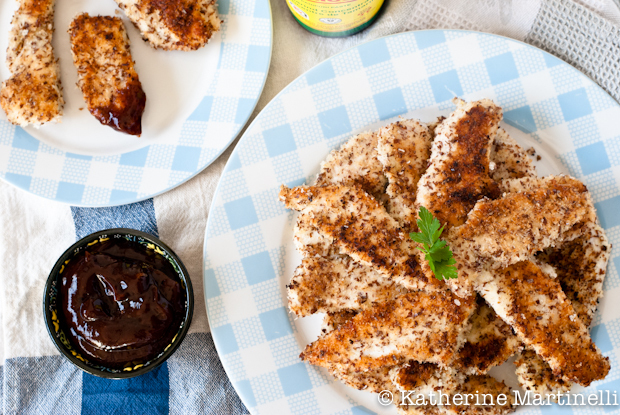 These gluten free coconut chicken finders with tamarind ketchup are as grown-up friendly as they are kid-friendly, so everyone in the family will be happy! Mix together the coconut, flax seeds, salt, and pepper in a shallow bowl. Dip the chicken in the egg then the coconut-flax seed mixture and put on a plate. Heat the oil in a wide skillet (it should come up about ½-inch) until quite hot but not sizzling. Add the chicken, cooking in batches if necessary. Cook for about 2 minutes per side, until crispy and lightly browned on the outside and fully cooked inside. Transfer to a paper towel-lined plate. Keep warm in a 200-degree oven if not serving right away (they're also great cold and make an excellent addition to salads the next day!). Mix together the ketchup and tamarind concentrate until smooth and free of lumps. Serve. What a gorgeous idea. 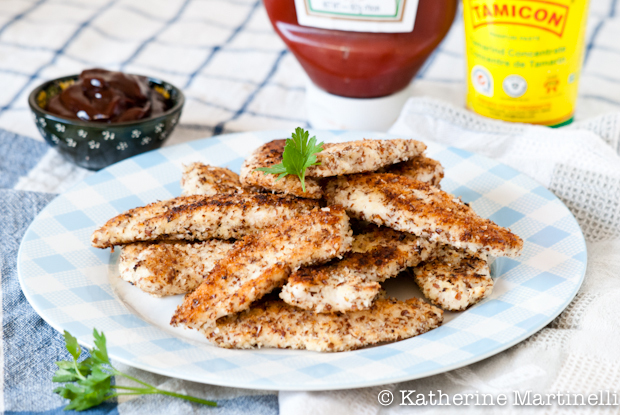 Love the flaxseed and coconut coating and folks here in goa would go nuts for your chicken dish Katherine. Love the combo of flax seed and coconut – think I’ll have to try this with prawns! Yum! These look delicious and the use of coconut was a very clever twist indeed. Oh geesh, my blog was made for this hop! Most of what I post is about having fun with food and silly creations for kids, so it’s hard to choose what to add! Happy Friday Katherine. Thanks so much for hosting such a fun theme! Love how healthy and yummy these look!! Fun dish! Love the idea of coconut – very creative. I’d certainly enjoy these, although I’m basically a big kid! Fun post – thanks. Thankfully, my son is not a picky eater and just eats what we eat so I consider most foods “kid friendly” unless they are super spicy. I love the addition of tamarind into the ketchup! Forget kids–these sound perfect for me! 🙂 I love the idea of a chicken finget with crispy coconut crust. Love the coconut on your chicken fingers! What a great idea! My boyfriend would love this. Tamarind and coconut are his favorite flavors.